Exposure to teratogens may cause birth defects. Zebrafish are useful for determining the teratogenic potential of chemicals. We demonstrate the utility of zebrafish by exposing embryos to various levels of nitrite and also at different times of exposure. We show that nitrite can be toxic and cause severe developmental defects. Keshari, V., Adeeb, B., Simmons, A. E., Simmons, T. W., Diep, C. Q. Zebrafish as a Model to Assess the Teratogenic Potential of Nitrite. J. Vis. Exp. (108), e53615, doi:10.3791/53615 (2016). High nitrate levels in the environment may result in congenital defects or miscarriages in humans. Presumably, this is due to the conversion of nitrate to nitrite by gut and salivary bacteria. However, in other mammalian studies, high nitrite levels do not cause birth defects, although they can lead to poor reproductive outcomes. Thus, the teratogenic potential of nitrite is not clear. It would be useful to have a vertebrate model system to easily assess teratogenic effects of nitrite or any other chemical of interest. Here, we demonstrate the utility of zebrafish (Danio rerio) to screen compounds for toxicity and embryonic defects. Zebrafish embryos are fertilized externally and have rapid development, making them a good model for teratogenic studies. 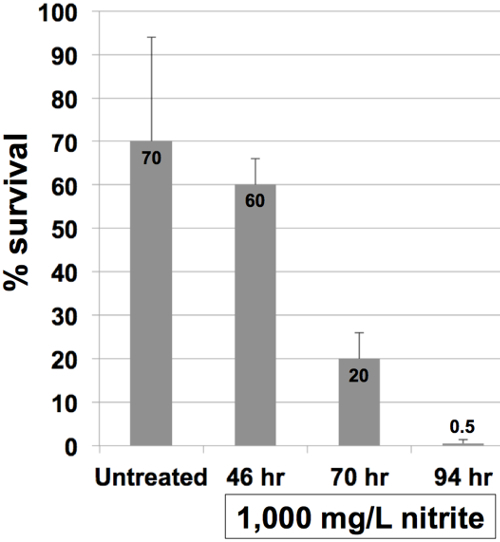 We show that increasing the time of exposure to nitrite negatively affects survival. Increasing the concentration of nitrite also adversely affects survival, whereas nitrate does not. For embryos that survive nitrite exposure, various defects can occur, including pericardial and yolk sac edema, swim bladder noninflation, and craniofacial malformation. Our results indicate that the zebrafish is a convenient system for studying the teratogenic potential of nitrite. This approach can easily be adapted to test other chemicals for their effects on early vertebrate development. Teratogenesis is a process that disrupts the normal development of an embryo or fetus by causing permanent structural and functional abnormalities, growth retardation, or miscarriage in severe cases1. It can be caused by certain natural agents (teratogens), which interfere with embryonic development in multiple ways2. During human fetal development, common teratogens such as radiation, infectious agents, toxic metals, and organic chemicals have been reported to cause defects in epicanthic folds (the skin fold in the upper eye lid) and clinodactyly (curved finger or toe) through morphogenetic errors1. Understanding the molecular mechanism of teratogenesis is the first step towards developing treatment and prevention. Several vertebrate models such as the African clawed frog (Xenopus laevis) and zebrafish (Danio rerio) have been used to determine the molecular pathways affected by teratogens. Previous studies have used zebrafish as a model for epidemiology, toxicology and teratogenesis3-7. Scholz et al. considered zebrafish as a "gold standard" for environmental toxicity assessment. This is due, in part, to the transparency of the zebrafish embryo, which allows researchers to visualize the developmental defect as it occurs8. Approximately 70% of human genes have orthologues in zebrafish, making zebrafish a desirable vertebrate model for studying human defects9. Some epidemiological studies have suggested that nitrate and nitrite, commonly present in farm foods and water, are associated with birth defects or spontaneous abortions10,11, while other studies do not support this association12. Nitrate (NO3-) and nitrite (NO2-) are naturally present in soil and water. They are a source of nitrogen for plants and are a part of the nitrogen cycle13. Foods such as green beans, carrots, squash, spinach, and beets from farms that use fertilizers high in nitrate have significantly augmented levels of nitrate and nitrite7. Milk from cows fed with high nitrate foods and fish in high nitrate water (mainly from soil runoff30) can lead to humans consuming large amounts of nitrate and nitrite14. Nitrate and nitrite are also commonly used in food preservation, which dramatically increases the amount ingested by humans12. Optimal levels of nitrate and nitrite play fundamental roles in physiological processes like vascular homeostasis and function, neurotransmission and immunological host defense mechanisms13-15. However, exposure to high levels of nitrate and nitrite may lead to adverse effects, especially in infants and children16. Ingested nitrate is further converted to nitrite in the oral cavity by microflora and in the gastrointestinal tract by intestinal microflora17. Nitrate puts infants at a high risk for blue baby syndrome by oxidation of hemoglobin to methemoglobin, impairing hemoglobin from its oxygen carrying ability18. This results in the blue color of skin that extends to peripheral tissues in more severe cases. Inhibited oxygenation of tissues results in other symptoms, most severely leading to coma and death19,20. Similar symptoms are observed in babies and adults at higher concentrations of nitrate21. Elevated levels of methemoglobin in adults due to nitrite poisoning results in cyanosis, headache, breathing disorders31, and death if not treated due to complications related to vital tissue hypoxia32,33. Nitrate ingested at higher levels can also result in various health complications. Childhood diabetes, recurrent diarrhea, and recurrent respiratory tract infections in children have been linked with high nitrate intake11,17,22. Chronic exposure to a high level of nitrate is associated with urination and spleen hemorrhaging. Acute high dose exposure to nitrates can lead to a wide spectrum of medical conditions like abdominal pain, muscle weakness, blood in stools and urine, fainting, and death11. Prenatal exposure to nitrate at high levels has been associated with neural tube and musculoskeletal defect11. A recent report showed that treating zebrafish embryos with nitrite led to yolk sac edema, craniofacial and axial malformations, and swim bladder noninflation5. In this study, we demonstrate a method for treating zebrafish embryos with nitrate and nitrite to determine their teratogenic potential. Embryos were exposed to nitrite at different concentrations and different lengths of time. Ethanol was used as a positive control, since it is an established teratogen23. Our method showed that both high concentrations and long exposure times to nitrite were detrimental to survival and resulted in various phenotypes, ranging from mild (edema) to severe (gross developmental defects). Therefore, the zebrafish is a useful model for directly exploring the potential teratogenic effects of nitrate and nitrite on embryos to complement epidemiological studies. The procedures described in this protocol were approved by the Institutional Animal Care and Use Committee at the Indiana University of Pennsylvania. Maintain zebrafish at 28.5 °C, pH 7, conductivity between 500-1,500 µS, and a light/dark cycle of 14 hr light and 10 hr dark24. Use wild-type strains such as Tü, AB or Tü/AB hybrid. Different strains may respond differently to chemical treatment25. Set up the fish for mating the night before harvesting eggs by adding fish system water into a mating tank. Add a male and female fish into the tank and separate the two fish with a divider. Each fish pair will produce a range of 50-300 eggs. To ensure that enough eggs will be produced, set up 30 pairs of fish. Typically, about 50% of fish pairs at the prime mating age (6-9 months old) will produce eggs, resulting up to 200 eggs per pair and a maximum of up to 3,000 eggs for this experiment. The next morning after the light turns on, remove the divider to initiate mating. Check the mating tanks for eggs every 15 min. Once the fish lay eggs, harvest all embryos using a tea strainer and combine them into one large container with E3 buffer (5 mM NaCl, 0.17 mM KCl, 0.33 mM CaCl2, 0.33 mM MgSO4). At 1.5 hpf, remove and discard unfertilized eggs with a plastic transfer pipet under a dissecting microscope. Unfertilized eggs are opaque while fertilized eggs are transparent34. Transfer 50 embryos into a 100 x 15 mm glass Petri dish containing 50 ml E3 buffer for each treatment condition. A total of 33 dishes are needed for 11 treatment conditions and 3 replicates. Carry out treatments at 2 hr post-fertilization (hpf)35. Incubate embryos/larvae at 28.5 °C and examine the larvae at 120 hpf. Perform at least three replicates of each treatment condition for statistical analysis. For 3 Petri dishes (each containing 50 embryos) at 2 hpf, remove the E3 buffer with a transfer pipet and add 50 ml of 300 mM ethanol diluted in E3 buffer. Cover the Petri dishes with Parafilm to minimize evaporation of ethanol. Continue exposing the embryos to ethanol for 22 hr. Then remove the ethanol with a transfer pipet. Add 50 ml of E3 buffer and swirl the dish several times to wash out the ethanol. Remove this E3 buffer with a transfer pipet and repeat the washing step 2 more times. For 3 Petri dishes (each containing 50 embryos) at 2 hpf, remove the E3 buffer with a transfer pipet and add 50 ml of new E3 buffer. For 9 Petri dishes (each containing 50 embryos) at 2 hpf, remove the E3 buffer with a transfer pipet and add 50 ml of 1,000 mg/L sodium nitrite dissolved in E3 buffer. Confirm the concentration of the stock nitrite solution beforehand using a modification of the diazotization (USEPA Method 354.1) spectrophotometric method28. Continue exposing 3 dishes for 46 hr, 3 dishes for 70 hr and 3 dishes for 94 hr. Replace the nitrite solution with freshly made nitrite solution daily. After each exposure time, remove the nitrite with a transfer pipet. Add 50 ml of E3 buffer and swirl the dish several times to wash out the nitrite. Remove this E3 buffer with a transfer pipet and repeat the washing step 2 more times. For 3 Petri dishes (each containing 50 embryos) at 2 hpf, remove the E3 buffer with a transfer pipet and add 50 ml of 200 mg/L sodium nitrite. Repeat this with 400, 600, 800, and 1,000 mg/L of sodium nitrite. Continue exposing the embryos to nitrite for 70 hr. Replace the nitrite solution with freshly made nitrite solution daily. After the exposure time, remove the nitrite with a transfer pipet. Add 50 ml of E3 buffer and swirl the dish several times to wash out the nitrite. Remove this E3 buffer with a transfer pipet and repeat the washing step 2 more times. For 3 Petri dishes (each containing 50 embryos) at 2 hpf, remove the E3 buffer with a transfer pipet and add 50 ml of 1,000 mg/L sodium nitrate dissolved in E3 buffer. Confirm the concentration of the stock nitrate solution beforehand using a modification of the cadmium reduction (USEPA Method 353.3) spectrophotometric method28. Continue exposing the embryos to nitrate for 70 hr. Replace the nitrate solution with freshly made nitrate solution daily. After the exposure time, remove the nitrate with a transfer pipet. Add 50 ml of E3 buffer and swirl the dish several times to wash out the nitrate. Remove this E3 buffer with a transfer pipet and repeat the washing step 2 more times. During each day of the exposure, count the number of dead embryo/larvae using a stereomicroscope. Signs of death include lack of heartbeat and blood circulation, or lack of motility after 1 min of observation. Remove dead embryos/larvae with a transfer pipet to reduce contamination of the E3 buffer. When experiments end at 120 hpf, euthanize the larvae. Remove the E3 buffer with a transfer pipet. Then add 50 ml of 0.2% MS-222 (buffered to pH 7) and wait for 10 min. Remove the MS-222 with a transfer pipet. Add 50 ml of E3 buffer and swirl to wash out the MS-222. Remove the E3 buffer with a transfer pipet and add 20 ml of 4% paraformaldehyde (PFA) to fix the larvae. Swirl the dish several times. Use a transfer pipet to transfer the larvae into a glass vial along with enough PFA to fill the vial. Store the vials in the refrigerator overnight (O/N). Take pictures of fixed larvae using a stereoscope with a digital camera. Use 30X magnification, ISO 200, and 200 msec exposure time. Orient the larvae so that the anterior to the left and the dorsal is to the top of the field. Exposure to 300 mM ethanol for 22 hr had no effect on survival (data not shown), consistent with previous reports5,23,26. This is expected, as ethanol is a known teratogen and served as a positive control. Observed phenotypes included pericardial edema, swim bladder noninflation (Figure 1), craniofacial defects, and developmental delay (data not shown). Treatment with nitrite resulted in mild to severe effects on survival, depending on the time of exposure. For example, exposure to 1,000 mg/L for 94 hr severely affected survival compared to shorter exposure times (Figure 2). We also assessed the effect of different nitrite concentrations on survival. Embryos were exposed for 70 hr to 200, 400, 600, 800, and 1,000 mg/L. Survival rates were lower when exposed to high concentrations of nitrite, whereas nitrate did not have an effect on survival (Figure 3). 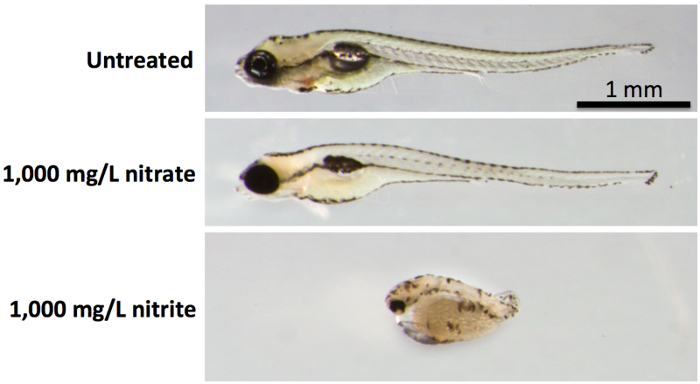 Phenotypes for nitrite-treated larvae resembled that of ethanol treated embryos (Figure 4). Figure 1: Developmental Effects of Ethanol Treatment. Embryos treated with ethanol showed pericardial edema (arrow), swim bladder noninflation (dashed line), yolk sac edema (arrowhead), and craniofacial defects (data not shown). Images were taken at 96 hpf. Please click here to view a larger version of this figure. Figure 2: Survival of 1,000 mg/L Nitrite Treatment after Different Times of Exposure. Embryos were exposed to 1,000 mg/L nitrite at 2 hpf. Nitrite was washed out after 46, 70, and 94 hr of exposure, and survival rate was calculated. Increased exposure time resulted in decreased survival rate. Standard deviations: Untreated = 24; 46 hr = 6; 70 hr = 6; 94 hr = 0.9. Please click here to view a larger version of this figure. Figure 3: Survival after Exposure to Different Nitrite Concentrations. Embryos were exposed for 70 hr to increasing concentrations of nitrite. Higher concentrations of nitrite resulted in lower survival rates. Nitrate had no effect even at the highest concentration of 1,000 mg/L after exposure for 70 hr. Standard deviations for nitrite: Untreated = 19; 200 mg/L = 16; 400 mg/L = 21; 600 mg/L = 20; 800 mg/L = 14; 1,000 mg/L = 12. Standard deviation for nitrate equals 4. Please click here to view a larger version of this figure. Figure 4: Developmental Effects of Nitrate and Nitrite. Embryos treated with 1,000 mg/L nitrate (middle panel) had no effect compared to the untreated control (top panel). Nitrite treatment at 1,000 mg/L resulted in gross developmental defects in addition to similar phenotypes observed in the ethanol treatment (bottom panel). Images were taken at 120 hpf. Please click here to view a larger version of this figure. The method described here demonstrates the utility of zebrafish in assessing the teratogenic potential of nitrite and nitrate. Compared to other vertebrates, zebrafish have advantages that include high fecundity, external fertilization, optical transparency, and rapid development. Available mutants that lack pigmentation (such as the casper zebrafish36) also help to enhance visibility of internal organs. It is also easy to generate transgenic zebrafish with reporter genes to facilitate analysis in live fish37. Because the zebrafish genome is conserved with humans, information gained from their studies can lead to translational results in humans9. The method can be applied to gene expression analysis, such as in situ hybridization, to gain additional information regarding the misregulation of genes caused by teratogens. Ethanol exposure did not significantly affect survival, but it did cause marked defects similar to previous reports5,23,26. This demonstrates that our method is reliable in repeating published results. Nitrate had no effect on survival, whereas nitrite did have a significant affect depending on concentration and time of exposure. Longer exposure and higher levels of nitrite had a negative effect on survival, consistent with previous results5. It was recently shown that excessive nitrite exposure caused defective heart valve development in zebrafish27, validating the use of zebrafish to study the mechanism of teratogens. It is critical to confirm the concentrations of working solutions after they are made. The concentrations of nitrate and nitrite can be measured using modifications of the cadmium reduction (USEPA Method 353.3) and diazotization (USEPA Method 354.1) spectrophotometric methods, respectively28. Another critical step is to cover the Petri plate with Parafilm to minimize evaporation of ethanol if this is used as a positive control. If larvae have unexpected mortalities (too high or too low), double-check the calculations and concentrations of the solutions. Recently, a similar method was used to determine the teratogenic effects of ethanol29. Although this method is similar to our method here, it only exposes embryos to ethanol for up to 24 hr, presumably due to the toxicity of exposing embryos to ethanol for a long period of time. In contrast, our method exposes embryos to nitrate and nitrite for several days with replacement of the test solutions daily. This is advantageous for testing less toxic chemicals. We envision that our method can be applied to test other drugs or specific environmental conditions. However, this method is limited to only testing water-soluble molecules. The light sensitivity of certain chemicals is another factor to consider. If test chemicals are light sensitive, wrap the Petri dishes in aluminum foil to protect from light. Also, the method is not good for testing water taken from a specific environment because laboratory zebrafish require specific conditions (such as pH and conductivity) for optimal development. Even so, the zebrafish serves as a favorable model to quickly determine developmental defects caused by potential teratogens. VK was funded by grants from the IUP Department of Biology and School of Graduate Studies and Research (Graduate Student Professional Development). CQD and TWS were supported by the IUP School of Graduate Studies and Research (Faculty Publication Costs/Incidental Research Expenses). We also thank members of the Diep laboratory for maintaining the zebrafish facility. Gilbert-Barness, E. Teratogenic causes of malformations. Ann Clin Lab Sci. 40, (2), 99-114 (2010). Brent, R. L. The cause and prevention of human birth defects: What have we learned in the past 50 years. Con Anom. 41, (1), 3-21 (2001). Lin, S., Zhao, Y., Nel, A. E. Zebrafish: an in vivo model for nano EHS studies. Small. 9, (9-10), 1608-1618 (2013). Pamanji, R., et al. Toxicity effects of profenofos on embryonic and larval development of zebrafish (Danio rerio). Environ Toxicol Pharmacol. 39, (2), 887-897 (2015). Simmons, A. E., Karimi, I., Talwar, M., Simmons, T. W. Effects of nitrite on development of embryos and early larval stages of the zebrafish (Danio rerio). Zebrafish. 9, (4), 200-206 (2012). Mantecca, P., et al. Toxicity Evaluation of a New Zn-Doped CuO Nanocomposite With Highly Effective Antibacterial Properties. Toxicol Sci. (2015). Jensen, F. B. Nitric oxide formation from nitrite in zebrafish. J Exp Biol. 210, 3387-3394 (2007). Scholz, S., et al. The zebrafish embryo model in environmental risk assessment--applications beyond acute toxicity testing). Environ Sci Pollut Res Int. 15, (5), 394-404 (2008). Howe, K., et al. The zebrafish reference genome sequence and its relationship to the human genome. Nature. 496, (7446), 498-503 (2013). CDC. Spontaneous abortions possibly related to ingestion of nitrate-contaminated well water--LaGrange County, Indiana, 1991-1994. MMWR Morb Mortal Wkly Rep. 45, (26), 569-572 (1996). Brender, J. D., et al. Prenatal nitrate intake from drinking water and selected birth defects in offspring of participants in the national birth defects prevention study. Environ Health Perspect. 121, (9), 1083-1089 (2013). Huber, J. C., et al. Maternal dietary intake of nitrates, nitrites and nitrosamines and selected birth defects in offspring: a case-control study. Nutr J. 12, 34 (2013). Phillips, W. E. Naturally occurring nitrate and nitrite in foods in relation to infant methaemoglobinaemia. Food Cosmet Toxicol. 9, (2), 219-228 (1971). Moncada, S., Palmer, R. M., Higgs, E. A. Nitric oxide: physiology, pathophysiology, and pharmacology. Pharmacol Rev. 43, (2), 109-142 (1991). Gladwin, M. T., Crawford, J. H., Patel, R. P. The biochemistry of nitric oxide, nitrite, and hemoglobin: role in blood flow regulation. Free Radic Biol Med. 36, (6), 707-717 (2004). Gupta, S. K., et al. Recurrent acute respiratory tract infections in areas with high nitrate concentrations in drinking water. Environ Health Perspect. 108, (4), 363-366 (2000). Kross, B. C., Ayebo, A. D., Fuortes, L. J. Methemoglobinemia: nitrate toxicity in rural America. Am Fam Physician. 46, (1), 183-188 (1992). Greer, F. R., Shannon, M. Infant methemoglobinemia: the role of dietary nitrate in food and water. Pediatrics. 116, (3), 784-786 (2005). Sanchez-Echaniz, J., Benito-Fernandez, J., Mintegui-Raso, S. Methemoglobinemia and consumption of vegetables in infants. Pediatrics. 107, (5), 1024-1028 (2001). Reregistration Eligibility Decision: Inorganic Nitrate/Nitrite (Sodium and Potassium Nitrates). U.S. Environmental Protection Agency. Available from: http://www.epa.gov/oppsrrd1/REDs/old_reds/4052red.pdf (1991). Virtanen, S. M., et al. Nitrate and nitrite intake and the risk for type 1 diabetes in Finnish children. Childhood Diabetes in Finland Study Group. Diabet Med. 11, (7), 656-662 (1994). Case Studies in Environmental Medicine: Nitrate/Nitrite Toxicity. U.S. Agency for Toxic Substances and Diseases Registry. Available from: http://www.atsdr.cdc.gov/HEC/CSEM/nitrate/docs/nitrate_nitrite.pdf (2001). Reimers, M. J., Flockton, A. R., Tanguay, R. L. Ethanol- and acetaldehyde-mediated developmental toxicity in zebrafish. Neurotoxicol Teratol. 26, (6), 769-781 (2004). Westerfield, M. The zebrafish book: A guide for the laboratory use of zebrafish (Danio rerio). 5th edn, University of Oregon Press. (2007). Loucks, E., Carvan, M. J. Strain-dependent effects of developmental ethanol exposure in zebrafish. Neurotoxicol Teratol. 26, (6), 745-755 (2004). Bilotta, J., Barnett, J. A., Hancock, L., Saszik, S. Ethanol exposure alters zebrafish development: a novel model of fetal alcohol syndrome. Neurotoxicol Teratol. 26, (2), 737-743 (2004). Li, J., Jia, W., Zhao, Q. Excessive nitrite affects zebrafish valvulogenesis through yielding too much NO signaling. PLoS One. 9, (3), e92728 (2014). Methods for chemical analysis of water and wastes. United States Environmental Protection Agency. Cincinnati, OH. Environmental Monitoring and Support Laboratory, Office of Research and Development (1983). Loucks, E., Ahlgren, S. Assessing teratogenic changes in a zebrafish model of fetal alcohol exposure. J Vis Exp. (61), (2012). Addiscott, T. M. Fertilizers and nitrate leaching. Agricultural Chemicals and the Environment, Issues in Environmental Science and Technology. book 5 1-26 (1996). Su, Y. F., Lu, L. H., Hsu, T. H., Chang, S. L., Lin, R. T. Successful treatment of methemoglobinemia in an elderly couple with severe cyanosis: two case reports. Journal of Medical Case Reports. 6, (290), (2012). Harvey, M., Cave, G., Chanwai, G. Fatal methaemoglobinaemia induced by self-poisoning with sodium nitrite. Emergency Medicine Australasia. 22, 463-465 (2010). Nishiguchi, M., Nushida, H., Okudaira, N., Nishio, H. An autopsy case of fatal methemoglobinemia due to ingestion of sodium. Forensic Research. 6, (2015). Avdesh, A., Chen, M., Martin-Iverson, M. T., Mondal, A., Ong, D., Rainey-Smith, S., et al. Regular Care and Maintenance of a Zebrafish (Danio rerio) Laboratory: An Introduction. J. Vis. Exp. (69), (2012). Kimmel, C. B., Ballard, W. W., Kimmel, S. R., Ullmann, B., Schilling, T. F. Stages of embryonic development of the zebrafish. Dev Dyn. 203, (3), 253-310 (1995). White, R. M., et al. Transparent adult zebrafish as a tool for in vivo transplantation analysis. Cell Stem Cell. 2, (2), 183-189 (2008). Tsang, M. Zebrafish: A tool for chemical screens. Birth Defects Res C Embryo Today. 90, (3), 185-192 (2010).